Don't let the small size fool you! These stackable 1" × 1" (2.5 cm ×2.5 cm) mini ink pads can be used in the same way as their full-size counterparts. 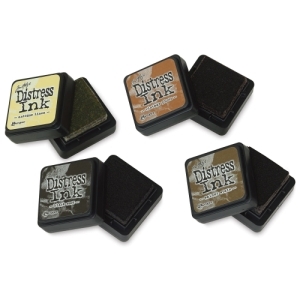 Each kit includes four Ranger Tim Holtz Distress Ink Mini Pads that coordinate with the Distress palette of products.